Thor Heyerdahl’s famous, semi-mad Kon-Tiki expedition of 1947 is of a piece with the intrepid history of the seabound trailblazing of Norwegians going back to Roald Amundsen and Fridtjof Nansen, to say nothing of Leif Erikson and the Vikings. The brave voyage saw the self-promoting adventurer/ethnographer and five crew members build and sail a traditional Peruvian balsa-wood raft from the South American coast halfway across the Pacific Ocean to French Polynesia to prove that those remote islands could have been settled from the east rather than the west and Asia, as goes the (still-prevailing) anthropological consensus. The subject of an Oscar-winning feature documentary in 1950 and several best-selling books, the Kon-Tiki expedition receives a semi-fictionalized big-screen glorification from Norwegian directorial duo Joachim Rønning and Espen Sandberg. Starring the lanky, piercingly blue-eyed Pål Sverre Vanheim Hagen as an impacably determined but notably quixotic version of Heyerdahl, Kon-Tiki aggrandizes a remarkable feat of daring, ingenuity and endurance into a quest of mythic heroism. As impressive, exciting, and beautiful as the film can be, it doesn’t engage honestly with the inconclusiveness of what the expedition truly proved about the history of Polynesian migration, not to mention the European imperialism that underscored the romanticized scientific quest narrative favoured by Heyerdahl and thus by the filmmakers. Kon-Tiki earned a Best Foreign-Language Film nomination from the Academy following its release, although the English-language version I viewed stumbles with painful inelegance and linguistic awkwardness through its establishing act. Heyerdahl, first seen courting danger as a child to impress his friends and requiring their rescue after falling into a frozen lake in his native Norway, begins formulating his still-controversial theory that the remote islands of Polynesia were settled by ancient sailors from South America rather than from Asia while living with and studying the native peoples of Fatu Hiva in the Marquesas along with his wife Liv (Agnes Kittelsen; Heyerdahl’s adventurism away from home sabotaged their marriage and led to divorce, which the film hints at). Noting similarities in the traditional statues of pre-Columbian South American and Polynesian cultures, Heyerdahl becomes convinced that a migratory voyage from the east over thousands of kilometres of open ocean was not only possible but likely, brushing aside the island-hopping travel patterns of the westward hypothesis, along with the volumes of solid evidence for an Asian origin for Polynesian settlement. With a book detailing his theories rejected by academic publishers in New York City, Heyerdahl desperately pivots from one of their dismissals to his seemingly-suicidal but publicity-friendly plan to build a balsa-wood raft without any modern materials and drift it himself across the inhospitable Pacific to prove his point. Reputable scientific-exploration societies shut him down as well, but a chance meeting in a Manhattan bar with an expat Norwegian engineer and refrigerator salesman named Herman Watzinger (Anders Baasmo Christiansen) who believes in the wild scheme gives Heyerdahl the impetus to travel to Peru and assemble a crew and a raft to attempt the voyage. One jaunty team-introducing scene and an assemblage montage later, Heyerdahl and crew push off from a Peruvian harbour on their raft, dubbed the Kon-Tiki, and are alone on the wide Pacific at the mercy of the ocean currents that they hope will convey them to their Polynesian target destination. Kon-Tiki the film launches at this point as well, becoming more taut, more involving, better-written, and even intermittently visionary. Heyerdahl & Co. encounter a drenching storm, an enormous, docile whale shark (the revelation shot of which is worthy of Jaws), and wondrous bioluminescent jellyfish; they contend with the waterlogged degradation of their raft, boredom and isolation, (largely fabricated) interpersonal conflict, and stalking, ominous sharks. A riveting shark attack sequence indeed constitutes the central fulcrum of the crew’s perilous voyage. It begins with an imprudent pet parrot, shifts to a gravitas-laden long holding shot of one crew member’s apprehension of their dangerous encirclement by the ocean predators that is like something out of the work of fellow Scandinavian director Ingmar Bergman, explodes in a burst of gore worthy of Peckinpah or Tarantino, and maintains a frayed-nerve disquiet through its (not unpredictable) concluding predicament. The entirety of the raft-borne scenes (which take up most of the running time) greatly elevate Kon-Tiki after its patchy, near-alienating opening, and this engrossing, masterful scene in particular seems torn from a much grander, finer Herzog-meets-Spielberg ocean epic of man’s emotional and existential precariousness and isolation in the face of nature’s indifferent lethality. A tremendous astral god’s-eye-view pull-back effects shot, the camera retreating skyward from the raft through the clouds and into atmospheric orbit before plunging back to our ocean-going heroes, emphasizes the solitude of their plight and the smallness of their accomplishment in universal terms. Kon-Tiki‘s gradually-won quality as a visual stunning and purely entertaining nautical adventure, its sheer, irresistible sweep, elides any number of artistic-license alterations, inventions, and intellectually dishonest omissions in the structuring of the narrative of Heyerdahl’s expedition (the screenplay is by Petter Skavlan). As if the truth of such a daring voyage, captained by a blond Norwegian academic with little sailing experience who couldn’t even swim, wasn’t incredible enough, Skavlan must embellish innumerable small details and plot conflicts. An ominous, threatening, and almost completely imaginary “Galapagos vortex” heightens the Kon-Tiki‘s peril as it drifts helplessly, in desperate hope of catching the equatorial currents that will take it to Polynesia; the “vortex” is a fantastical invention, and the illustration shown to Heyerdahl by a crew member comes from an Edgar Allen Poe story (and is even captioned as such in the book shown). Heyerdahl was in fact more concerned that the highly-maneuverable raft’s failure to catch the requisite currents would lead it to the Central American coast and thus fail to support his theory. Watzinger suffers particularly from the scriptual inventions: in real life a formidable physical specimen, former athlete, and WWII Norwegian resistance veteran like three other crew members, Christiansen plays him as a pudgy, worrisome burden on the others, a laughably poor match for the adventurous life whose engineer’s concern for the structural integrity of the raft nearly undermines Heyerdahl’s fanaticism for maintaining a historically-accurate recreation of the ancient Peruvians’ raft technology. Conflicts on board the raft were evidently rare, the relative harmony of the operations usually attributed to Heyerdahl’s planning and steady leadership. A more subtle but perhaps greater transgression lies hidden in Kon-Tiki‘s inspirational surge of score-swelling triumph at the success of Heyerdahl’s quest. Despite Heyerdahl’s assertions that the Kon-Tiki expedition proved that at least some of Polynesia was settled by South American travellers, what it proved was only that the voyage could have been made by indigenous peoples circa 500 A.D. A wealth of cultural, anthropological, linguistic, geographic, botanical, biological, and genetic evidence supports the Asian settlement hypothesis, which remains the scientific consensus. Kon-Tiki does not acknowledge this as it would feel like admitting that the Kon-Tiki‘s remarkable feat was a quasi-empirical folly, impressive as derring-do but inconclusive as science. There is also no mention of Heyerdahl’s massively dubious, ethnocentric (indeed, nearly Aryanist) belief that the South American voyages to Polynesia were undertaken by tall, white-skinned, red-haired people of European ancestry, which flies as flagrantly in the face of everything known about Pre-Columbian Andean civilization as, say, the Book of Mormon does. 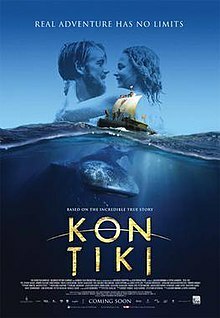 Perhaps one might hope that Kon-Tiki was more upfront about some of this, or that it recognized the imperial arrogance at the heart of Thor Heyerdahl’s paternalistic regard for ancient Peruvians and indigenous Polynesians and his quest to demonstrate their kinship through a practical demonstration of seamanship. Like the Kon-Tiki expedition itself, this film embraces the romance of adventure over the cold, rational aggregation of scientific truth. Heyerdahl was canny enough to understand that the sweeping appeal of such romance would gloss over the weaknesses of his studies, and Rønning and Sandberg are canny and skilled enough to grasp and to demonstrate that principle as well.